Clayton Byrd is a bluesman, or at least he’s going to be someday. He spends most of his time with his grandfather, Cool Papa Byrd, who is also his best friend. When Cool Papa unexpectedly passes away, Clayton misses him dearly and struggles adjusting. To make matters worse, his mother sells all of Cool Papa’s things, which were intended for Clayton. After she confiscates his blues harp, Clayton decides to run away. A day of skipping school and accidentally getting in with a gang lands him in jail, where his mother picks him up. She calls his father, who tells them that they’re all hurting and they all need to talk. The book ends with the implication that they did so and that things are running much more smoothly. From Newbery Honor Winner Rita Williams-Garcia comes another powerful story. 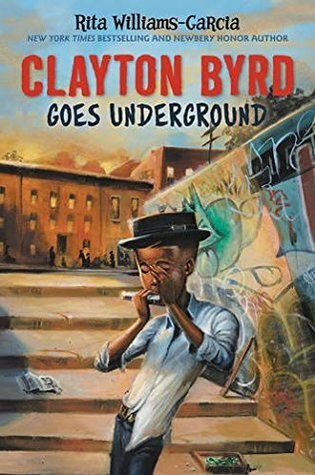 Clayton Byrd Goes Underground addresses themes of death, family, and love in an achingly tender way. The use of blues music as a vehicle for grief and feeling works so beautifully to portray the relationship between Clayton and his grandfather, both before and after his death. The writing style and speaking dialect in the book helps give the story a bluesy feel. The book is a fast-read, but it is well paced until the very end where it closes abruptly, leaving a lot assumed. The rest of the plot is interesting and well-developed, in a way that keeps readers invested. Heartfelt and engaging, this book is a great one to add to a home or classroom library!